"Assyria: Past, Present and Future"
Four lectures in four countries (Sweden, The Netherlands, Germany and France) were delivered by Mr. Fred Aprim and Mr. Firas Jatou on specific topics related to the past, presence and future state of Assyrians. Together with sister organizations, the Holland based "Assyria Foundation of the Netherlands" set up these lectures that raised awareness among the different Assyrian communities (Orthodox and Catholics) about their ancestral homeland, the political developments and the forced demographic changes that had taken place in Assyria in the past and continue to be excercised today. The Holland based “Foundation Assyria Netherlands,” was established and is maintained by a dedicated group of Syriac-Orthodox Assyrians from Tur Abdin (North Assyria). In his presentation, "A Roadmap to Assyrian National Progress," Mr. Jatou discussed the current and future state of Assyrian affairs. He emphasized the need for further cooperation between the Diaspora communities and in those in the homeland ( Assyria ). Mr. Jatou ventured in the opportunities that Assyrians could take advantage of. He explained what the Nineveh Plain Project is about and the role of the Iraq Sustainable Democracy Project (ISDP) initiated by the Assyrian Academic Society with the help of several community activists in USA . He stressed the importance of establishing such a structure in Europe and Australia as well to empower our people worldwide and especially those back in the homeland. He addressed the current demographic and cultural situation in northern Iraq ( Assyria ) where it was the best chance to revive this national and cultural renaissance. The illustrated presentation was moving and very informative. That the Assyrian name is of modern invention that was created by the British missionaries in the mid 19th century. That with the collapse of Nineveh in 612 B.C., the Assyrians were wiped out and disappeared and their cities were never mentioned again. That when Assyrians adopted Aramaic Alphabet, they lost their Assyrian Akkadian language. That Assyrians have not used typical Assyrian names like Ashur and Sargon until more recently. Mr. Aprim presented many historical references and examples to prove the continuity of the Assyrian people and civilization and to show that the above four points were absolutely wrong and nothing but myths. He also addressed other points that are important when addressing continuity. These include: Uninterrupted connection to land, language continuity, religion and other cultural related issues. Mr. Aprim addressed other factors that influenced this continuity and survival (positively or nagatively), including: confusing titles, governments policies, Islam, Kurds and the so-called Kurdistan, and other related issues. The first lecture was hosted by the Assyrian Youth Federation in Sweden (AUF), under the guidance of AUF-president Mr Aryo Makko (originally from Anhil Village- Tur Abdin), Mr Peter Butros (Hujodo Magazine staff writer) and moderation by the Swedish Assyrian journalist Mr Abrohom Stayfo (originally from Bote village – Tur Abdin). The AUF with about 8,500 members throughout Sweden is considered as one of the biggest and active Assyrian organizations in Europe. The AUF was established by members of the Syriac Orthodox of Midyat and surroundings in Tur Abdin in the early 1980s. Still 90% of the AUF members are of Syriac Orthodox faith. On Saturday, 9th of June, in Norrkoping, the Assyrian youth that is raised in Sweden listened to the two speakers. The evening ended by the performance of the singer Habib Mousa, who is originally from Azekh (Beth Zabday) in Tur Abdin and his talented Oriental Assyrian Lute player Josef Cacan (originally from Arbo, Tur Abdin). Among the delivered songs was the classical “Awaken son of Assyria, Awaken!”, written by the legendary Prof. Naum Faik of Omid/Amid (Diyarbekir), Arch-Deacon of the Syrian Orthodox Church and official teacher at the Syrian Orthodox Patriarchate in Dayr-Zafaran in Mardin before he fled to the USA just before the genocide in 1915. The AUF purchased all of Mr. Aprim's books. The Lecture was hosted by the Assyrian Youth Federation. The members of the AJF are of Syriac Orthodox faith and mostly from the Qamishly region of northern Assyria. The local cultural association, the Assyrian Mesopotamian Association of Enschede (AMVE), which was established in the 1980s by a group of Christians from Tur Abdin (Arbo, Badibe and Mzizakh), set-up the event at the hall of the AMVE. Mrs Shamiram Demirdag (originally from Habsis village, Tur Abdin) opened the event in the western Assyrian dialect (Suryoyo) on behalf of the Assyrian Youth Federation, followed by an explanatory introduction by the representative of the Foundation Assyrian Netherlands. The lectures were held in English language, translated simultaneaously in western assyrian (Suryoyo) dialect by M. Beth Arsan., M.D. (originally from Arbo – Tur Abdin). This lecture was hosted by the local cultural associaton in cooperation with Assyrian Youth Federation Central Europe (AJM). Mr. Aziz Zeitoun, Beth Garsho – born in Qabre Hewore (originally from Arbo – Tur Abdin), President of the Assyrian Mesopotamia Association of Gutersloh, welcomed the guests and the speakers. The same method of lecturing and simultaneous translation was done. In Gutersloh Mr. Jatou honored the Chief Editor of the Funoyo-Assyrian Magazine, Mr Nuri Ayaz (originally from Anhil, Tur Abdin), for his continues work for the Assyrian community in Germany. 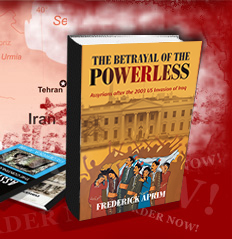 An overwhelming interest in the books of Mr. Aprim resulted in the complete sell out of one of the books. Discussions were done in Assyrian (western and eastern dialects), English and German languages. The last lecture was hosted by the Association Assyro-Chaldean de France of the Chaldean community. The hall of the Chaldean Cathedral, St. Thomas the Apostle (Mar Touma Shleeh'a) was the location for the lecture. The Chaldean community in Paris, originating from the villages of Gaznakh, Ischy, Harbol, Hassana (betweend the Tur-Abdin and Hakkari mountains, on the Tigris river in northern Assyria), is about 15,000 strong. They are fluent in the Eastern Assyrian dialect and Turkish. Among the attendants were the priest and church deacons. Mr. Aprim's books were all purchased by the Chaldean community. The entire lecture was recorded by the Association Assyro-Chaldean de France; however, highlights of the presentation were later broadcasted on Iraq based Ishtar Satellite TV. Mrs. Attiya Gamri – Assyrian politician in The Netherlands.